Justin Thomas did not win the Tour Championship on Sunday at East Lake. He finished second to Xander Schauffele despite burning down the back nine with a torrid finish that included three birdies in his last six holes. Thomas, who finished at 11 under, had a putt on No. 18 that would have eventually gotten him into a playoff with Schauffele that narrowly fell to the low side. 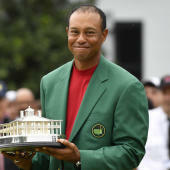 However, none of that really matters because Thomas' second-place finish was enough to secure him the FedEx Cup trophy and a $10 million bonus for taking the season-long race. Thomas beat out Jordan Spieth for first. Schauffele, because he was so far back in the race to start the Tour Championship, finished third. Thomas earned it, too. He shot a bogey-free 33 on the front and made killer birdies at Nos. 16 and 17. His 66 on Sunday was straight out of his closing playbook (he finished No. 3 on the PGA Tour this year in final round scoring average), and it looked for a while like he might steal the Tour Championship in addition to his FedEx Cup victory. After missing his birdie attempt on No. 18, though, Thomas again missed a playoff by the narrowest of margins after Schauffele's tournament-winning putt went all the way around the cup and fell on the final hole. Thomas was battling comers from all sides on Sunday, too. Not only was he jousting Schauffele for the tournament win, he was trying to fend off a charging Spieth (among others) for the $10 million. Because he put himself in such a good position over the first three days, closing came a little easier. "It's a really weird day," Thomas told Dan Hicks of NBC. "It's hard at first because as a competitor, you're made you didn't win the tournament. Then you have to realize what an unbelievable honor this is, the fact that you can win something over the course of an entire year. "Like [PGA Tour commissioner] Jay [Monahan] said, I played really well all season. It was nice to play well in some playoff events finally and have it all pay off. It was grueling day for sure and very nerve-wracking, but Xander is a tremendous champion and I'm very pleased to be walking away with this." Thomas capped a five-win season by becoming the first golfer since Tiger Woods in 2009 to win the FedEx Cup without winning the Tour Championship (Phil Mickelson won it that year). He will unquestionably be the 2016-17 PGA Tour Player of the Year and has now earned just under $20 million total this season including the FedEx Cup bump. Most people saw a bright future for Thomas, but I'm not sure anybody (including Thomas) saw this. He won all over the planet and was the most consistently great player on the PGA Tour this season. "It was a lot of hard work, for sure," Thomas told NBC about why he experienced so much success in 2017. "I put a lot of hard work in in the off weeks and the offseason. In terms of actual golf game, my short game helped me out a lot. The weeks I was playing well, I was making putts like I was today, and that's why I spent all the time working on it. I was glad that it paid off." Thomas came into the final week in the top 50 in strokes gained around the green as well as putting. Of course, the wins wouldn't be possible if he wasn't also one of the best drivers and ball-strikers on Tour. He finished in the top five in both of those categories this week. It's been an all-time year for the 24-year-old, who also took his first major championship at Quail Hollow in August, and it's fitting that he is crowned in a year we will remember as the one he owned throughout. From the CIMB Classic win last fall to the Hawaii double to the PGA Championship to the playoffs, 2016-17 has been J.T. 's season. We remember years for specific players. Rory McIlroy owned 2014 with two majors. Jordan Spieth took 2015 with two majors and the Tour Championship. Dustin Johnson was 2016's poster boy after a U.S. Open title and two other events. And this year was Thomas'. Now he has the cash to prove it. Thomas started the calendar year at No. 22 in the world, and he'll end the season inside the top five and as one of the leaders on the U.S. Presidents Cup team. I have no idea what his future holds, but if it's half as good as what we got in 2017, then we're in for a hell of a career.